Craig Kopczak and Tyler Randell tackle London's Greg Richards. PIC: Chris Mangnall/SWpix.com. 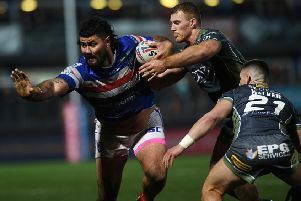 Wakefield Trinity have some "big issues" to fix following their shock opening-day defeat against London Broncos on Sunday afternoon. Chris Chester's side had led 18-6 midway through the first half before going on to lose the game 42-24 against the Super League newcomers. The Wakefield chief expressed concerns about his team's defence and felt his players "looked lost" with the ball in hand. "Without taking to much credit away from London, we killed ourselves," said a disappointed Chester. "We had a lack of respect for the ball, defensively we were all over the shop. "Defending the try line like we where in that first half, we have obviously got some big issues on the edges. David Fifita escapes the clutches of Matt Ioane. PIC: Chris Mangnall/SWpix.com. "I think the first five tries came from poor defensive reads. "It is very, very disappointing. I am disappointed for the fans that have turned up today. "We just looked lost at times, we looked lost with the ball. "We have got to find a way back, it is frustrating." Chester admitted some of his players may have been too relaxed in the lead up to Sunday's clash. He also felt that the defeat was one of the worst performances his side has produced during his time as head coach. He added: "There was a bit of relaxed attitude during the week, there was a couple of sessions that didn't go entirely to plan. "But as the week went on, it got better. "Maybe we are not as good a team as everyone is tipping us to be. "It is really frustrating, with the attitude and the performance. "I thought defensively in the first 15 to 20 minutes we were really good and we scored some nice tries. "Without looking at the video I have no idea what happened for the last 60 minutes. "It was probably the worst [performance] since I have been involved." Chester was full of praise for the Broncos, however, insisting that they were well worth their victory: "I don't want to take anything away from London, I thought they were excellent. "They executed their plays really well, they kicked the ball better than us and caused us a lot of trouble. "But mainly, we hurt ourselves."